The CIRCUIT-FIX system has been designed to allow you to cut accurate, burr-free copper foil traces for PC boards for the purpose of adding to or repairing a circuit board. CIRCUIT-FIX is a handy system whether for prototype modifications or for circuit repairs. The system centers on a spring-loaded clamp and cutting guide that permits excellent trace cutting with a modeling knife. 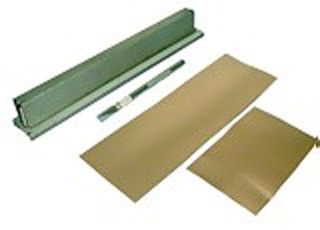 Both the knife and a sheet of self adhesive copper trace material are included. Also included is a sheet of (assorted sizes) pure copper self-adhesive donut pads. The cut trace and donuts are burnished to the board and then soldered to component leads.